Introductory Mathematics: Algebra and Analysis by Geoff Smith, Springer Verlag, 1998. Groups St Andrews 1997 Volume I, edited by C. M. Campell, E. F. Robertson, N. Ruskuc and G.C. Smith, Cambridge University Press 1999. Groups St Andrews 1997 Volume II, edited by C. M. Campell, E. F. Robertson, N. Ruskuc and G.C. Smith, Cambridge University Press 1999. Topics in Group Theory by Geoff Smith and Olga Tabachnikova, Springer Verlag, 2000. Groups St Andrews 2001 Volume I, edited by C. M. Campell, E. F. Robertson, and G.C. Smith, Cambridge University Press 2003. Groups St Andrews 2001 Volume II, edited by C. M. Campell, E. F. Robertson, and G.C. Smith, Cambridge University Press 2003. 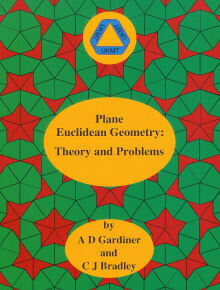 Plane Euclidean Geometry by C. J. Bradley and A. D. Gardiner, edited by G. C. Smith, United Kingdom Mathematics Trust 2005. Introductions to Number Theory and Inequalities by C. J. Bradley, edited by G. C. Smith, United Kingdom Mathematics Trust 2005. The Algebra of Geometry by C. J. Bradley, edited by G. C. Smith, Highperception 2007. When teaching undergraduate linear algebra at the University of Bath, I strongly recommend the the text by Blyth and Robertson in the SUMS series. I have spotted a couple of minor glitches in Basic Linear Algebra which readers may wish to note.